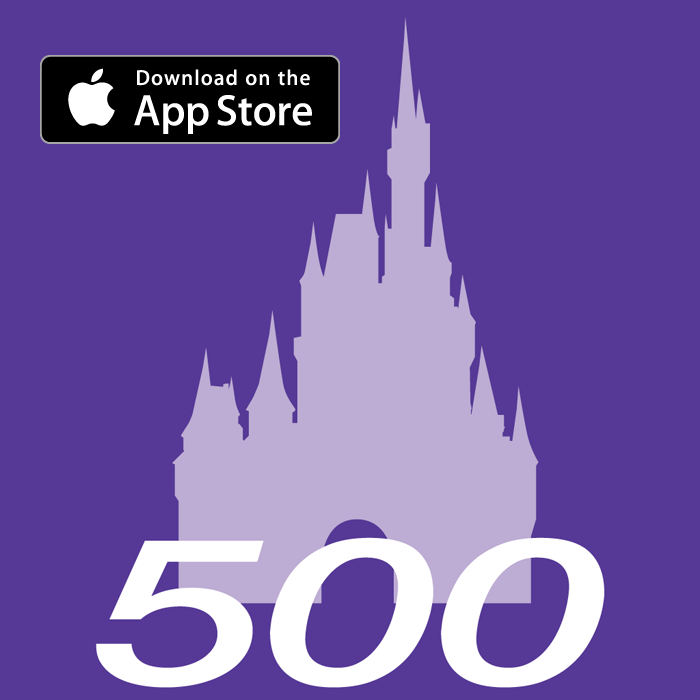 All voting is closed and the champion has been crowned. 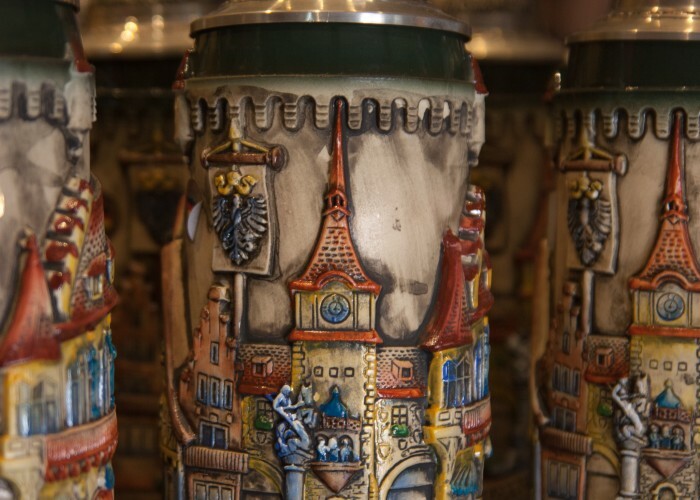 Click here to find out who is the 2014 Disney Beer Tournament Champion! 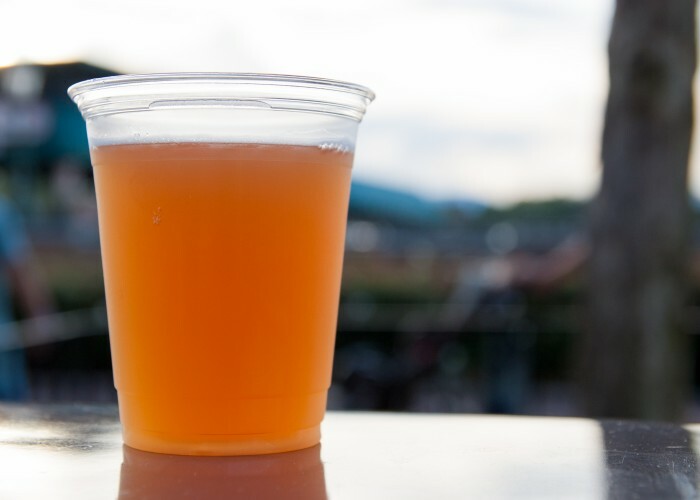 This is the final week of the Disney Beer Tournament! 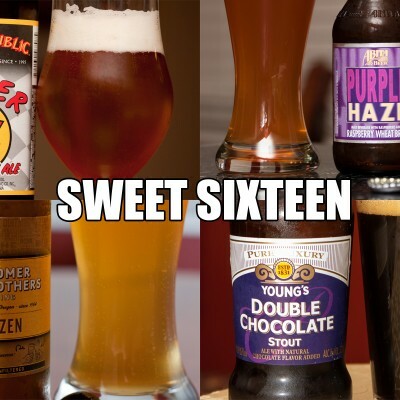 Over the past two weeks, we’ve gone from 64 beers to just four, and by this time next week we’ll have a champion! First, your reactions during the last round (we might enjoy this more than the actual tournament). 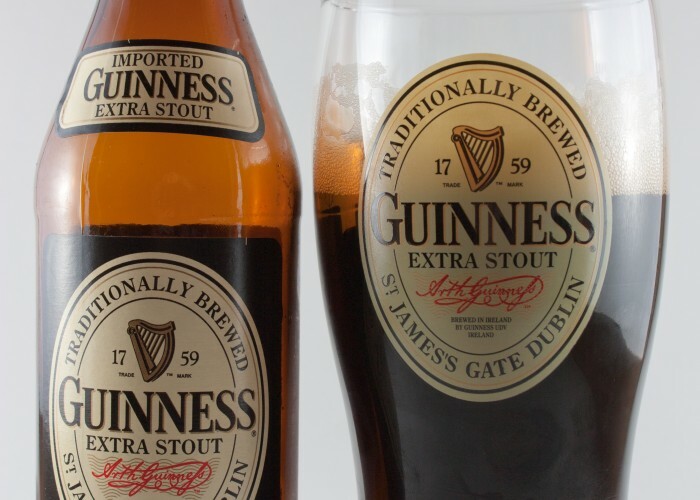 @beersandears I waited all morning for this tweet. It was only 8:00 AM EDT when the article was posted. 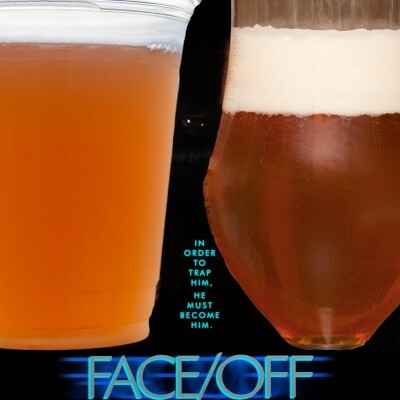 So clearly @beersandears Final Four is going to be IPA vs IPA and Belgian vs Belgian, right!? Was Ken right? You’ll just have to wait and see. 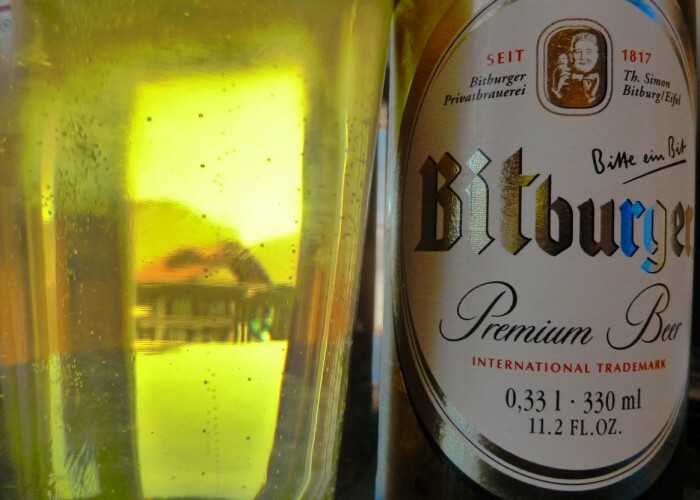 It was early then, but did Widmer Hefeweizen’s status improve? The Elite Eight matchups were too difficult for some. 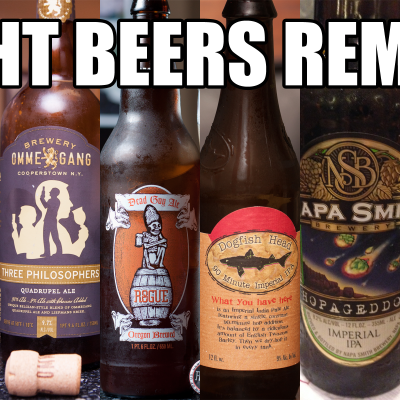 @WonderlandNerds @beersandears @hintofspy can we reshuffle the seeds? I hate pitting friends against friends. Did Duffy sway anyone’s vote? If you aren't voting for Dogfish 90 in the @beersandears Beer Tournament, Duffy is personally going to come to your house and shame you. We know Duffy didn’t sway Kim’s vote. Dwaine Perkins, the face of Disney Beer Tournament dedication. 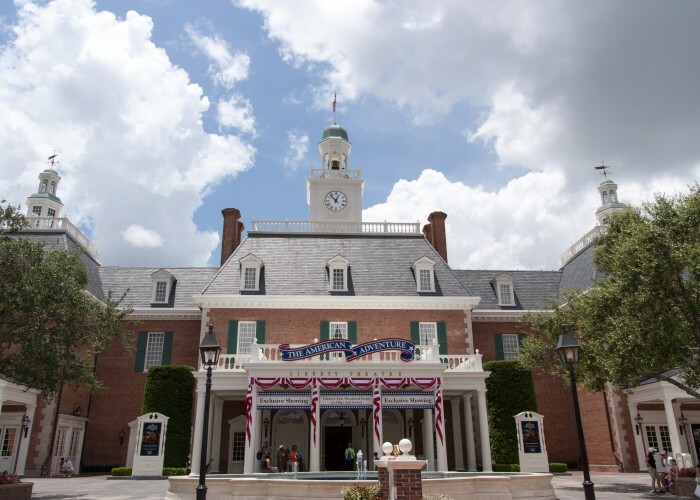 Remember, voting begins today for round five, the Final Four, and ends Wednesday, April 2, 2014 at 7:00 PM EDT/6:00 PM CDT. 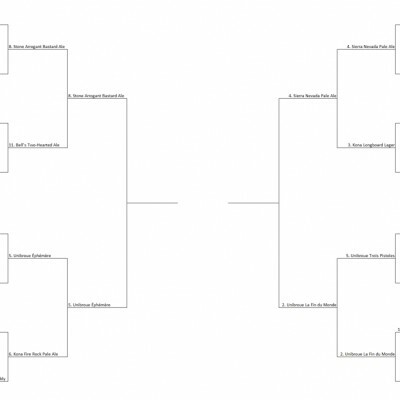 We’re saving the full bracket for the end to avoid spoilers. Who are the regional champions? Let’s find out! First, the Mickey region champion. 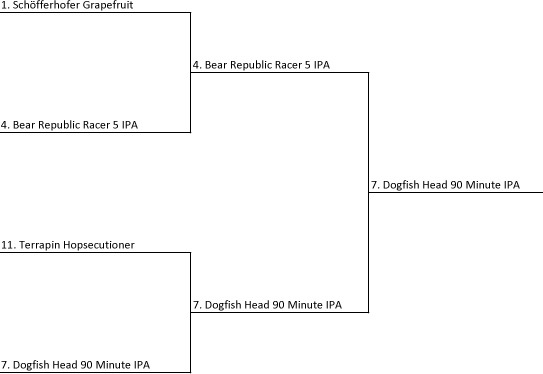 It was a close match, but Dogfish Head 90 Minute IPA held off Bear Republic Racer 5 IPA and won by just five votes. 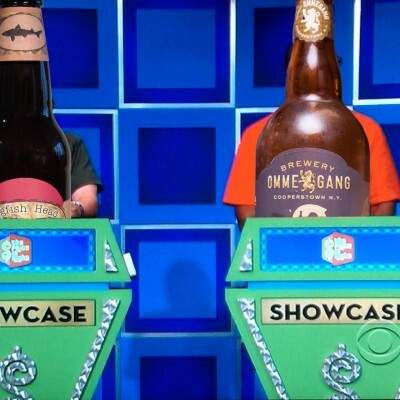 Dogfish Head 90 Minute IPA will face the winner of the Donald region, which we’ll get to in a moment. Who won the Minnie region? Let’s find out! The Minnie regional final wasn’t as close. 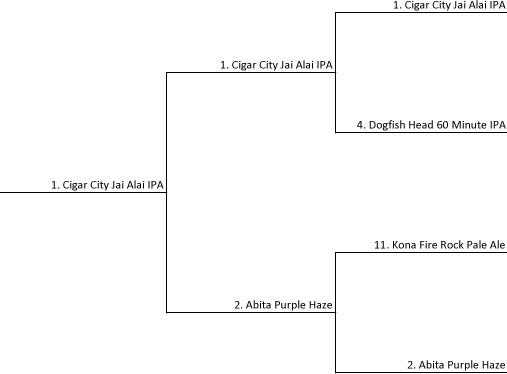 Cigar City Jai Alai IPA was just too much for Abita Purple Haze and won with 60% of votes cast! Jai Alai faces the Goofy regional winner. Let’s review the Donald regional final! 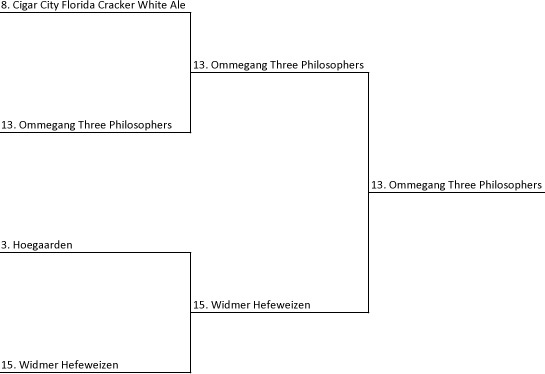 Ommegang Three Philosophers dominated this matchup, receiving 81% of the vote over Widmer Hefeweizen (sorry Neil). Here’s the matchup from the left side of the bracket; who moves on to the championship game? Finally, the Goofy regional winner! As you may have guessed from the top picture, this matchup came down to one vote. If you’ve ever doubted whether your vote counted in this tournament, it absolutely did here. 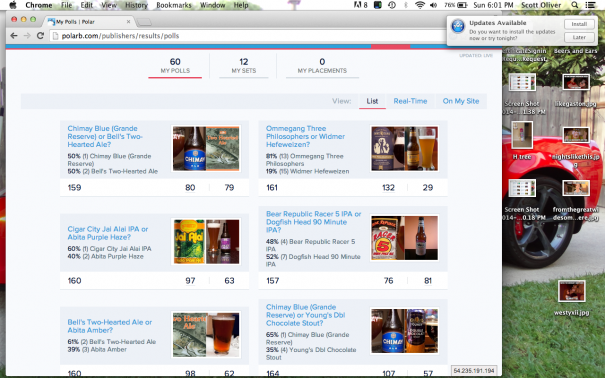 Since this came down to one vote, let’s talk a little bit about our “poll closing” process. The one and only thing we can’t do with Polar that we could do with the old system is actually shut a poll down without deleting it. Everything else with Polar is so much better that we went with it anyway. Since we don’t have a big shiny button that says “close poll”, we take a screen shot at closing time and all results are based off that screen shot. Here is the screen shot from the Polar dashboard with the Chimay/Two-Hearted poll at the top left. The screen shot says 6:01 PM on the clock because it was taken in the Central time zone. 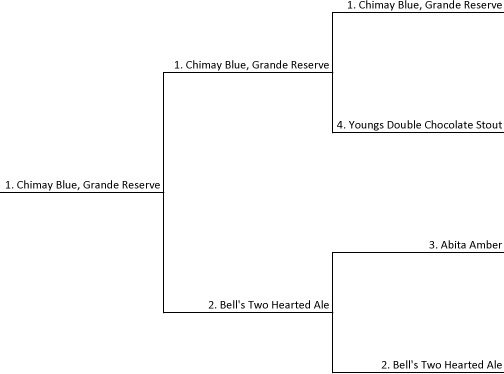 As you can see, Chimay Blue (Grande Reserve) won by the slimmest of margins over Bell’s Two-Hearted Ale when the polls closed. Both one seeds on the right side of the bracket still remain. Only one can move on to the championship; who will it be? Voting will end Wednesday, April 2, 2014 at 7:00 PM EDT/6:00 PM CDT. The winners will be announced Thursday morning and the championship will begin! We decided to wait until the end to show the full bracket this time; click to enlarge of course. 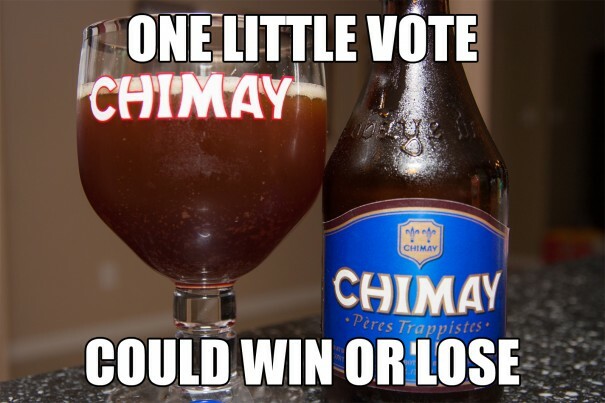 Chimay Blue is the best beer ever, period.